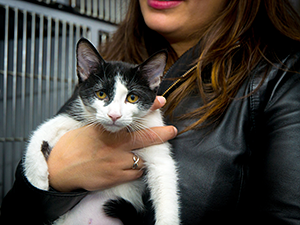 Saturday, November 15, 2014 – New York, NY – Two hundred cats, kittens, and rabbits seeking families to call their own today met potential adopters at the fifth annual Whiskers in Wonderland adoption extravaganza. Presented by the Mayor’s Alliance for NYC’s Animals (the Alliance), the event took place at Petco Union Square (17th Street & Broadway) from 11:00 a.m. to 5:00 p.m.
Hoffman also noted that in New York City, cats and kittens are taken in by rescue organizations at a rate of three-to-one compared to dogs. Cats and kittens make up almost 63 percent of the animals in New York City shelters who need homes. 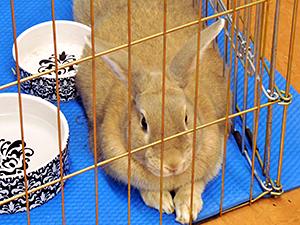 The kittens, cats, and rabbits for adoption at Whiskers in Wonderland were provided by non-profit animal rescue groups and shelters that participate in the Alliance. Rock & Rawhide, a non-profit organization that provides distraction therapy to shelter animals with pet toys, blankets, and other comforting items to help increase adoptions, was on hand at the event to accept donations from the public. Hoffman extended her gratitude to all of today’s adopters, as well as Petco, the participating adoption groups, and volunteers who made this year’s Whiskers in Wonderland a great success. Courtney Savoia, LAK Public Relations, Inc.